With a large digital display and fully automatic operation, all segments of the cycle (fill, sterilize, exhaust and dry) commence and run to completion by simply pressing the start button. An optional thermal mini-printer is also available for providing a record of sterilization parameters and a USB drive can be used to record settings and transfer them to a PC. The 16 liter BioClave™ offers preset cycle options (standard programs), for use with liquids, wrapped research instruments or unwrapped instruments / plasticware. An additional option "Dry Only" is also available for additional drying time to be added to the end of a cycle. For special applications, requiring variations in cycle parameters, all settings on the BioClave™ 16 are fully adjustable. 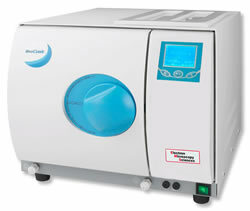 The 8 liter BioClave™ Mini is preprogrammed to meet basic sterilization needs. 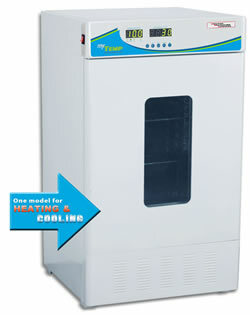 Temperature can be selected at either 121°C or 134°C, and the sterilization time is fully adjustable. The economical BioClave Mini™ is the ideal choice wherever benchtop sterilization is required and space is limited. Chamber Dimensions 9 (W) x 13.75 (D)"
23 x 35 cm 6.7 (W) x 12.5 (D)"
Tray Dimensions 6.5 (W) x 10.75 (D)"
16.5 x 27 cm 4.75 (W) x 9.75 (D)"
Exterior Dimensions 22 (W) x 17.5 (D) x 15.7 (H)"
56 x 44.5 x 40 cm 20 (W) x 13.5 (D) x 12.9 (H)"
This Oven/Incubator with an aluminum inner chamber, and venting is up to the task of providing many years of long service in busy labs. The cast aluminum chamber provides for dependable temperature uniformity and the vent efficiently expels moisture and vapors. The unit comes complete with a Removable shelf. General drying and incubation applications. The Most Popular, Multipurpose Vacuum Ovens! Powder coated heavy guage steel exterior construction. 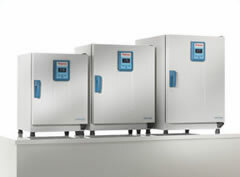 With digital temperature control, the MyTemp™ incubators provide convenient "set and walk away" operation, eliminating the need for external thermometers and the repetitive "fine tuning" of an analog control knob. 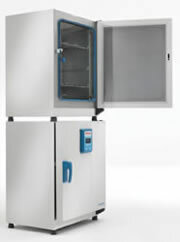 Simply choose the desired temperature and the incubator immediately begins to heat up (or cool down, HC model only) while accurately monitoring the chamber temperature and conveniently displaying the temperature in real time on the large LED control panel. 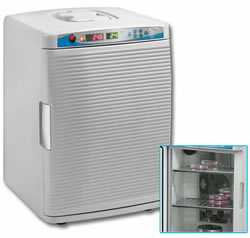 Despite a modest footprint of 13 x 14.5", the MyTemp™ incubators feature large internal chambers, capable of storing flasks and bottles up to 2 liters. In addition, the incubators include two adjustable shelves and an internal outlet for powering small shakers, rockers and other instrumentation. 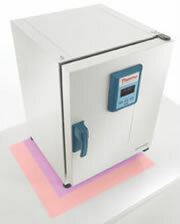 A Mini Nutating Rocker (supplied with both flat and dimpled mats) is available for agitation of samples during incubation. At only 13 inches wide, the myTemp Mini CO2 is the smallest and most economical incubator for applications requiring CO2 gas control. 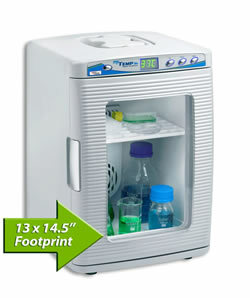 Its small footprint makes the incubator ideal for use inside of biological safety cabinets, isolating sensitive cultures or for any laboratory simply trying to conserve bench space. 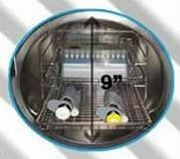 With a thick layer of high efficiency insulation surrounding the chamber, the incubator is also ideal for transportation of cells. 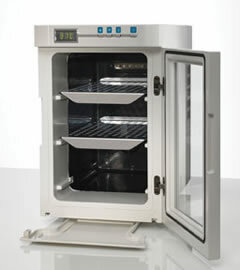 Once power has been disconnected, the incubator maintains temperature levels within 10% of the set parameter for up to 1 hour*. 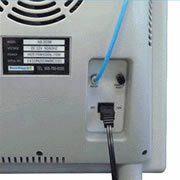 In addition, each model includes a 12V vehicle power adapter for operating the instrument in a car, boat, etc. Both the temperature and CO2 percentage are digitally adjustable and displayed in real time on the large LED control panel. 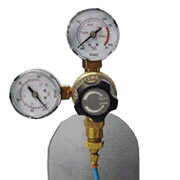 This panel also features a "Cal" function, for easy in-lab calibration of the temperature or CO2. 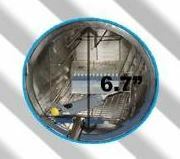 In addition, humidity (up to 80%) can be added to the chamber by inserting the included (stainless steel) humidity reservoir. The CO2 level is constantly monitored using dual beam infrared sensing technology. In the event of a drop in CO2, audible and visual alarms are triggered, notifying the user of the error. 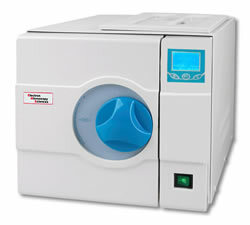 Despite its small size, the incubator features a relatively large 20L chamber with the capacity for flasks and bottles up to 2 liters. Two removable, stainless-steel shelves are included. 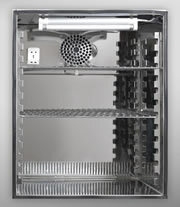 The shelves are perforated to improve airflow within the chamber. 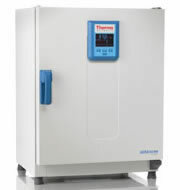 The EMS MyTemp™ 65HC Incubator is designed to provide accurate and uniform temperature control from 0 to 60°C. 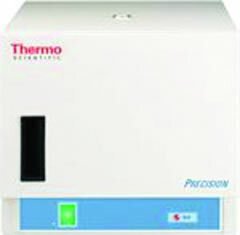 The broad temperature range of the instrument expands the use of this incubator to both heating and cooling applications. With forced air technology and stainless steel inner construction, uniform heat transfer is ensured throughout the internal chamber. When set for sub-ambient temperatures, the powerful compressor is activated, quickly cooling the chamber to the desired temperature. With an exterior height of 39" (100 cm), the incubator is designed to be floor-standing, yet is also compact enough for bench-use. Not recommended for use on benchtops taller than 32" (81 cm). The instrument is supplied with two, adjustable height shelves, while additional shelves can also be purchased separately. 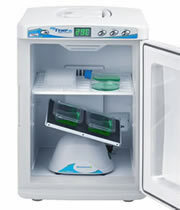 Low Cost Incubator for Clinic or Classroom! Electrical (50/60 Hz) Ship Wgt. †Value assumes fan is off. With fan at full speed, uniformity is ±0.2°C (51028066), ±0.3°C (51028067), and ±0.4°C (51028068).